Today’s toy pick in the 2017 PopCult Gift Guide is actually two elegantly crafted “plastic Army men” style sets of figures, one of which depicts Robin Hood and his Merry Men, the other of which depicts the Sheriff of Nottingham and his nasty minions. This is the perfect gift for the young (or young at heart) person on your holiday shopping list who has an interest in the possibly fictitious adventures of the man who did the opposite of what Congress is planning with their Tax Reform bill. 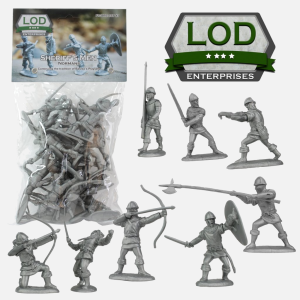 “Rob from the rich and give to the poor!” cry Robin Hood and his Merry Men in this set from LOD Enterprises. Each polybag includes 16 heroic medieval outlaws in 8 poses that stand up to 2.5 inches tall and are approximately 1:32 scale. These are highly detailed and realistic figures are made from fairly stiff plastic in forest green color. These figures were originally released by Ron Barszo Playsets in 2007 and are now produced by LOD Enterprises with Ron’s blessing. LOD Enterprises is committed to producing figures with superior sculpting, historical accuracy, and attention to detail, yet also with a nod to the past so they mix perfectly with figures from Marx, Atlantic, TSSD, Superior, and Toyway. These are recommended for ages 14 and up. Playset collectors, who go nuts over figures like these, are starting to increase their ranks. Younger collectors who didn’t grow up in the era of Marx and the classic playset are discovering that there’s lots of fun to be had with these guys, plus the smaller size makes it a heck of a lot easier to store your collection. LOD is resurrecting some of the premium high-quality figures made by other companies in the past, and the craftsmanship on these is just astounding. Where you have Robin Hood, the evil Sheriff of Nottingham and his Norman Soldiers can’t be far behind. You can also find this cool set that includes 16 medieval knights in 8 poses that stand up to 2.4 inches tall and are approximately 1:32 scale. Highly detailed and realistic figures are made from fairly stiff plastic in silver gray color. These are also made by LOD from Rob Barszo’s molds. The LOD Robin Hood and Sheriff of Nottingham sets can be ordered directly from VictoryBuy and may seem a little pricey, but you’re getting really high quality sculpts made with good plastic and these are toys that will be loved and played with for years to come.